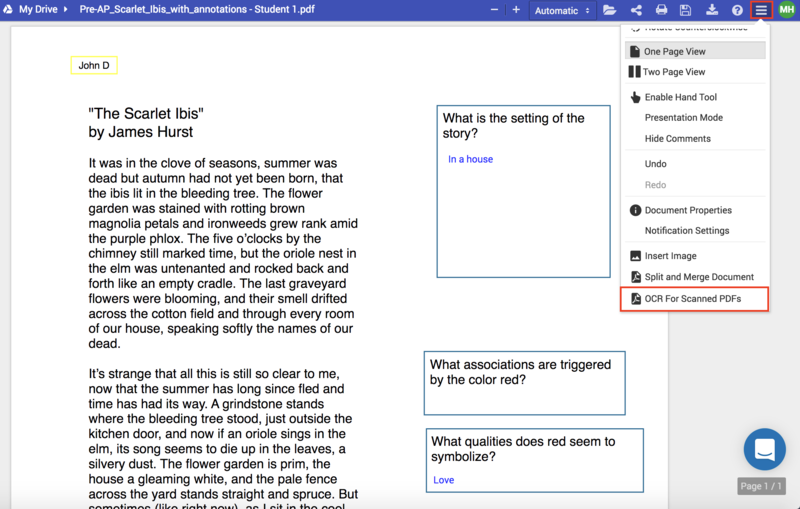 Documents that are scanned may lack the embedded text that allows the Kami annotation tools to work, and that allows text to be copied out of the document. If you are having trouble selecting text with the tools, or if the Text to Speech is unintelligible, you are likely using a scanned PDF. We now have an OCR (Optical Character Recognition) tool, available from the home page, at https://tools.kamihq.com/ocr, from the in-app menu. This tool will detect the text in the document. To use the OCR tool, drag a file in or click to choose one from your computer or Google Drive. Once the file has finished processing, you can download it or open it in Kami.